ATLANTA – Making her first high-profile foray into the Southern black church, California Sen. Kamala Harris told a Georgia congregation founded by former freed slaves that the United States remains wracked by racism, sexism and other forms of discrimination that flout the nation's core values. But the rising Democratic Party star added that Americans aren't as split as "forces of hate and division" suggest. "I believe it is time we replace the divide-and-conquer," she said from the pulpit of First Congregational Church in downtown Atlanta. "I've come up with an equation: diversity plus commonality equals unity." Yet her approach highlights a complex political task for Democrats as they try to counter Trump's economic appeals to working-class whites, while honoring their core supporters among nonwhites, to rebuild the electoral coalitions that twice elected President Barack Obama. And the choice of venue — a congregation that includes business, civic and political players in Atlanta's black community — also nods to a Democratic constituency that helped sway the party's last two presidential nominating battles. Harris's future prospects dominated her appearance as the invited keynote for the 150th anniversary of First Congregational Church's founding. Introducing Harris, church member and personal friend of the senator Eugene Duffy called the occasion "a day of projection and reflection." At the word "projection," Duffy pointed at the senator. Duffy also dispensed with Harris's avoidance of lambasting the Trump administration, praising her for her aggressive questioning of "that white supremacist Jeff Sessions," the nation's attorney general. He said Harris "pulled (Sessions') sheet off" at hearings on Capitol Hill. Harris smiled but did not clap as did many congregants as Duffy blasted Sessions. 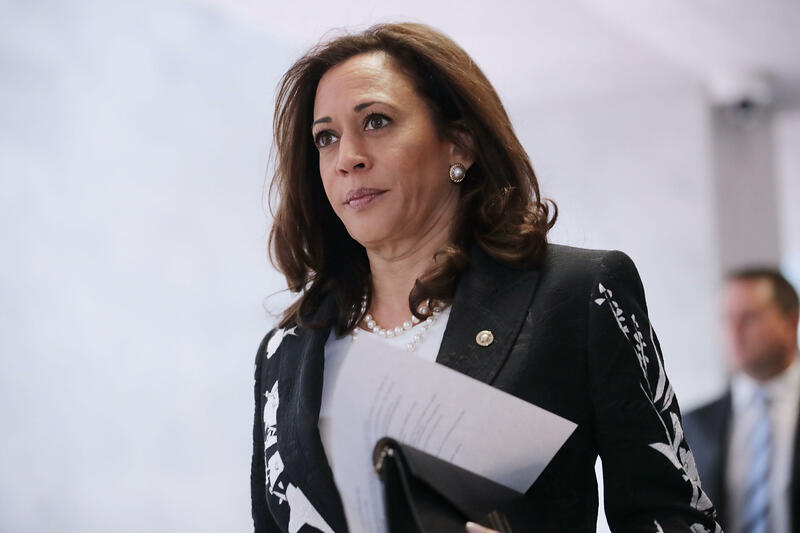 From the pulpit, Harris criticized "the attorney general," without naming Sessions, for renewing the push for harsher sentences in nonviolent drug crimes and for rolling back some of policing overhauls from the Obama administration. A former local prosecutor and California attorney general who opposes the death penalty, Harris says she advocates a criminal justice system that honors "the concept of redemption." Separately, Harris called for a more effective U.S. response to hurricane devastation in Puerto Rico. She did not mention health care. She's recently signed on as a co-sponsor of Vermont Sen. Bernie Sanders' "Medicare-for-all" bill. Harris does not publicly embrace speculation about 2020 intentions. Her calendar is noticeably devoid of visits to the early nominating states of Iowa, New Hampshire and South Carolina. But she's also met in recent months with key Democratic donors and hired aides who worked for 2016 presidential nominee Hillary Clinton.